Make sure you sample both the cuisine and atmosphere of the top restaurants surrounding the hotel in Paris’ gourmet district. Typical and unusual sites: guided tours of the most prestigious sites near the 4-star Royal Madeleine Hotel. 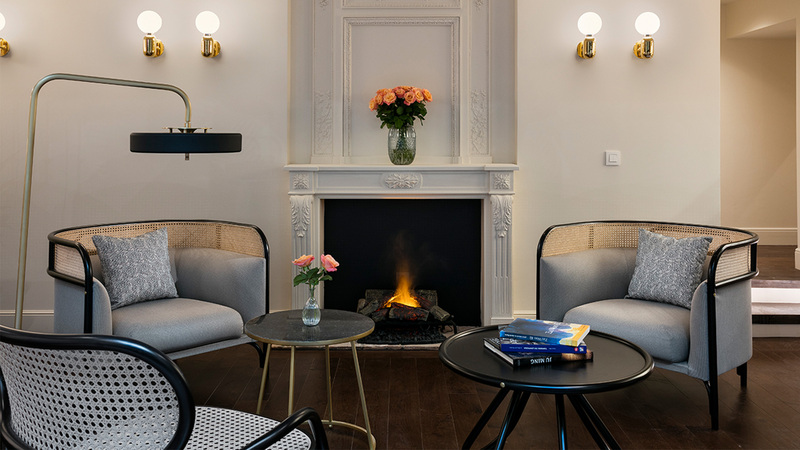 In the heart of Paris’ ultra-chic 8th arrondissement, the 4-star Royal Madeleine Hotel is the ideal landmark for fashion addicts. Whether you want advice on top spots or help with organising a transfer to the train station or airport, our 4-star Royal Madeleine Hotel concierge team provides personalised services on par with the establishment’s prestige. Our reception team welcome you upon arrival and can show you to your room. Purchase some souvenirs and delicious Royal Madeleine chocolates from our boutique corner. We work to ensure everyone enjoys their stay, with the hotel afternoon tea served every day from 4pm to 5.30pm, drinks in the lounge and a play area for children. Dine at the counter, in the winter garden or on the Passage Puteaux terrace. The 4-star Royal Madeleine Hotel will treat you to a menu of simple, tasty dishes created using seasonal ingredients. The Madeleine C serves French cuisine prepared by a master restaurateur using fresh ingredients, ensuring quality dishes for a clientèle that delights in 100% home-made accompaniments and desserts. In a minimalist interior with laden bookshelves, the tasty dishes take you on a journey of discovery. Set sail for the south of France with your first bite of one of the chef’s mouthwatering dishes or a more traditional grill. Ideally located in one of Paris’ most touristy districts, Café Madeleine invites you inside to discover its gourmet menu. Enjoy the terrace draped in red while savouring quality products. Pizza and Italian specialities near the theatres, Olympia, Concorde and Place Vendôme: all the flavours of Italy are present for a family brunch or an aperitif with friends. Founded in 1875, this legendary, must-visit Grands Boulevards brasserie has a prime location only a stone’s throw from Opéra Garnier and revamps the traditional dishes that have made French cuisine famous. Jean-François Piège set up his fine dining restaurant, Le Grand Restaurant/Jean-François Piège, in the heart of the golden triangle. As the chef’s flagship, this restaurant has become his think tank and gourmet creation laboratory. In an elegant, understated setting, this traditional brasserie with its hint of whimsy serves traditional Parisian classics using products selected from local artisans known for their quality. Located at the foot of the Eglise de la Madeleine, the Maison de la Truffe’s tasting room tempts you in to savour traditionally or creatively prepared truffle, stimulating your five senses. The Arc de Triomphe de l’Étoile is a monument overflowing with history. At 50m high, it offers a unique view of Paris and the Louvre-Concorde-Champs-Elysées-Grande Arche de la Défense vista. This former Parisian private mansion is now the French President’s official residence, office and headquarters. The palace has become highly symbolic of the French Republic and is surrounded by a two- hectare garden. In one of the most prestigious theatre halls in Paris, built in 1924 in an Italian style, you can discover a programme of classical repertoire and modern author pieces. This unique religious structure, located between Place de la Concorde and Opéra Garnier in Haussmann’s Paris, looks like a Greek temple with no cross or bell tower. You can visit it by yourself or take a guided tour. This Parisian cabaret in the Champs-Elysées district is a legendary site for glamorous shows. The timeless Crazy Horse moves with the times, putting on artistic shows that blend performance and aesthetics. Step into one of the most elegant ornamental gardens in Paris, similar to the l’Europe district. A walk in this garden holds many surprises: statues, stunning trees, birds and a large pond. This most famous and beautiful avenue in the world, measuring almost two kilometres, follows Paris’ historic axis. From Place de la Concorde to Place Charles-de-Gaulle, the luxury stores, outdoor restaurants, palaces, prestigious destinations, museums and popular monuments sit alongside each other. This Parisian scientific/cultural centre and museum covers 25,000 m² of the Grand Palais’ west wing. The Universcience site presents science in a dynamic way through interactive experiences. This iconic Parisian monument on the edge of the Champs-Elysées and opposite the Petit Palais presents the biggest exhibitions, which are beautifully showcased in fantastically large spaces and attract over two million visitors every year. This museum of fine arts and decorative arts, owned by Institut de France, exhibits artwork collections worthy of the greatest museums. The stunning Second Empire private mansion has preserved the ambiance of such a great residence, making it a unique site in Paris.